Is there a difference between female and male cat behavior? Most people who have lived with both would probably say there’s not. Male cats tend to be more affectionate, but females can be very loving, too. Females are often better hunters, but many males also love to hunt. But while your cat’s behavior may depend more on personality than gender, there are some subtle differences between female and male cat behavior. Male cats are notorious for what humans consider “bad” habits. They spray, they fight, they roam. Although this male cat behavior is most common in unneutered cats, many neutered males and spayed females also spray and fight over territory, especially when they’re stressed by life in multi-cat homes. Underlying all male cat behavior are the needs to establish and protect a safe territory and to mate. Testosterone is a powerful hormone in unneutered male cats and drives almost everything they do. With those hormones coursing through his body, an unneutered male cat may wander seven miles or even more in search of a mate. While neutering may solve some common behavior problems, neutered males are still all male. It’s the Y chromosome unique to male cats that bathes the brain in testosterone as it develops in the mother’s uterus. The testosterone permanently changes the structure and chemistry of the brain. Since these changes don’t disappear when the cat is neutered, he will always demonstrate some male cat behavior. In addition to helping to prevent the birth of unwanted kittens, neutering prevents testicular cancer and reduces problem male cat behavior. Neutered males no longer feel the need to search for a mate and are less likely to wander. They’re also less likely to fight. How will neutering change your boy’s personality? 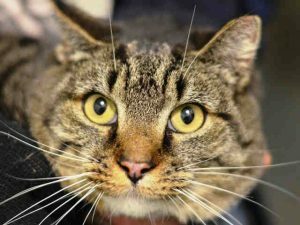 According to a survey by veterinarian and animal behaviorist Bruce Fogle, he’ll probably be friendlier to other cats, tolerate handling better and will be more affectionate and playful. He might also demand more attention than he did before he was neutered. You’re stroking your neutered male cat, and he suddenly turns on you and grabs your hand with his teeth and front claws. Veterinarian and animal behaviorist Myrna Milani says the stroking “has awakened shadows of sexual behavior.” All you have to do, she says, is mimic an experienced female cat and remain quiet and motionless. Your boy will lose interest and let go of your hand. There’s a way to prevent this, too. Just count the number of times you can pet your cat before he attacks. If he attacks at five pets, stop at four. And learn to read his body language. Most cats will warn you when they’ve had enough attention. It’s also a good idea to teach kittens to play with toys, not human hands. Spraying isn’t just male cat behavior. Female cats also spray when they’re stressed.